Our goal with the 2018 Business Retention & Expansion Survey (BR&E) was to identify major challenges facing local businesses and tailor our programs and advocacy to address the most pressing needs. 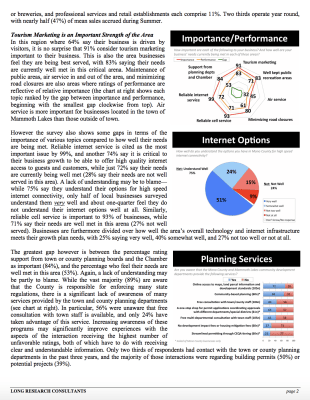 BR&E surveys are used worldwide to analyze strengths and weaknesses of a community and set priorities to keep local businesses thriving and growing. BR&E surveys are an economic development tool that focuses on assessing and caring for the existing businesses in a community. If existing businesses are sticking around and expanding, new businesses are more likely to come to your community. This survey was conducted in partnership with Mono County Tourism & Economic Development. We worked with Long Research Consultants in Bethesda, Maryland on this project. 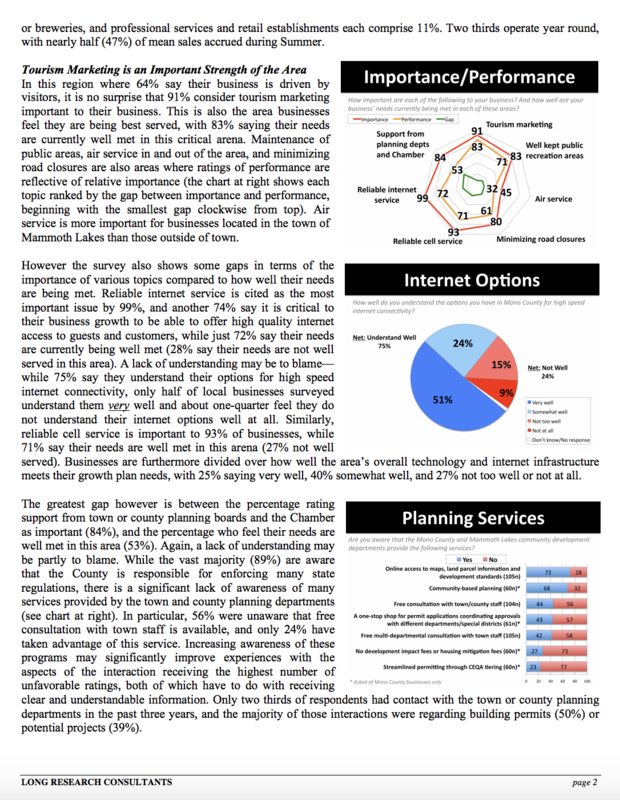 We interviewed 131 businesses for this survey (80 in Mono County, 51 in Mammoth Lakes). The margin of error is +/- 8.5 percentage points. It was a long survey -- 97 questions -- and it took anywhere from 45 minutes to two hours for each business to complete. We are so grateful to the businesses that took the time to sit down with us and share their thoughts and insight. 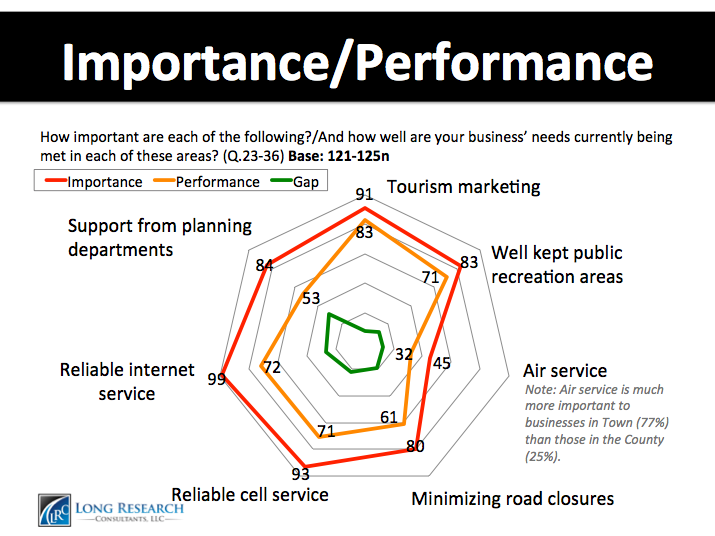 When asked if air service was important to their business, 77% of businesses in Mammoth Lakes said it was, compared to only 25% of Mono County businesses. 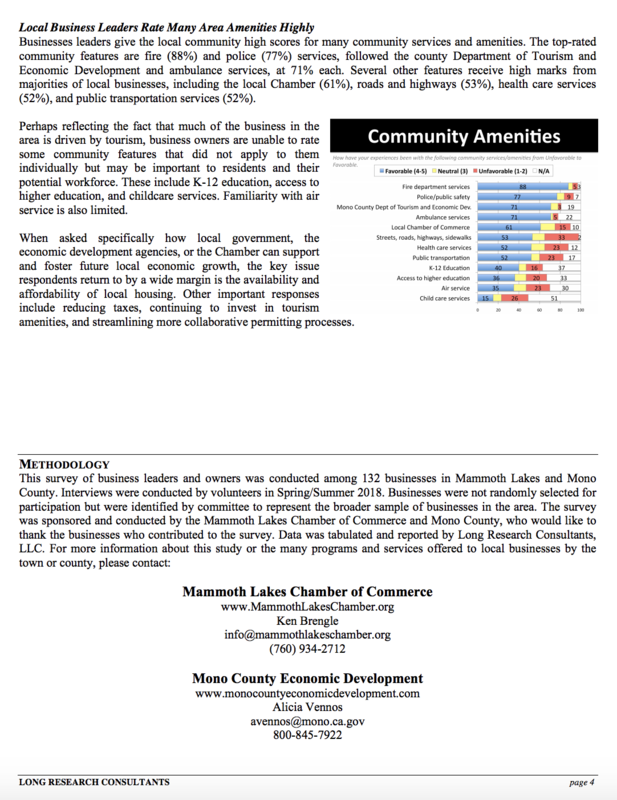 When asked how their experiences have been with their local Chamber of Commerce, 81% of Mammoth Lakes businesses said somewhat or very favorable. For the whole sample, 61% of businesses rated their local Chamber favorably. With the Mammoth Lakes Chamber of Commerce being the most active and the only one with paid staff, this makes sense. 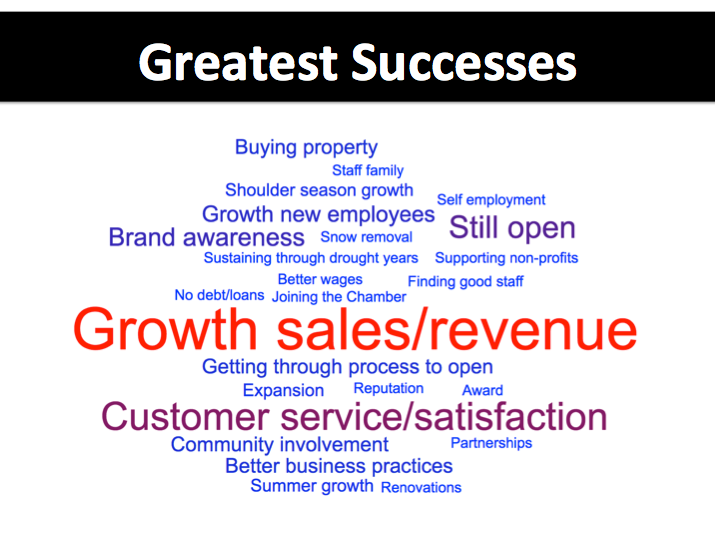 When we asked Mammoth Lakes businesses what their greatest success was in the past five years, the top responses were in the categories of sales/revenue growth, increasing customer service and satisfaction, still being open, increasing awareness of their business and adding new employees. So what can we do? 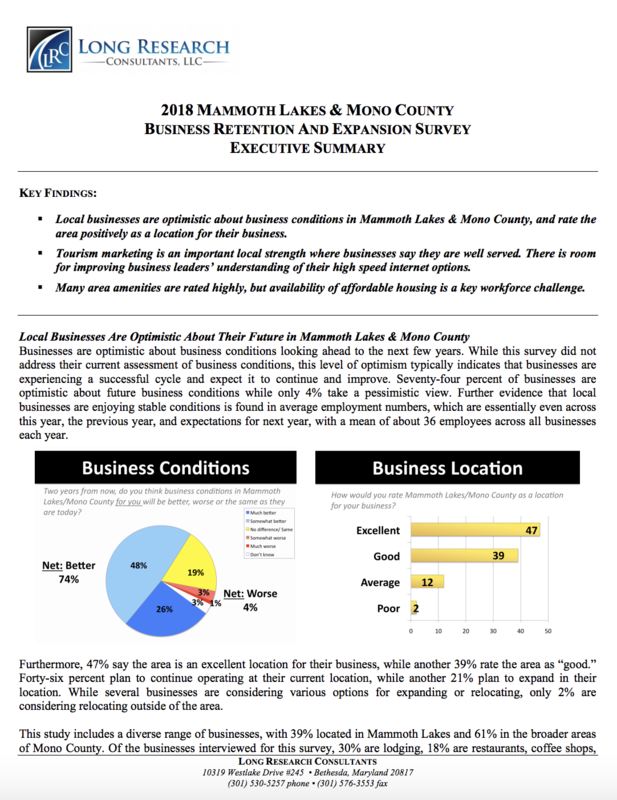 We asked Mammoth Lakes business owners what they needed/wanted to see from local government, economic development agencies and their Chamber of Commerce. 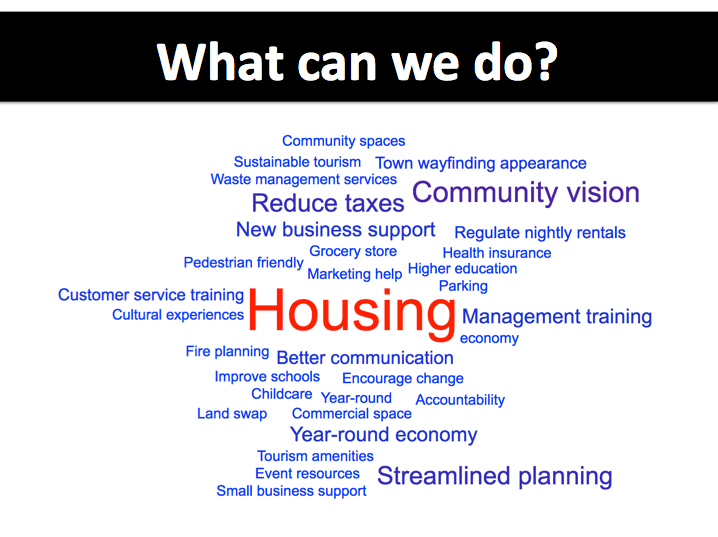 The highest priority by far was work on affordability and availability of local housing, followed by working together/having a community vision, reducing taxes, streamlining the permitting and planning process and continuing to invest in tourism and provide small and new business support. As we seek to improve important community issues, this survey reiterates the need for the town, county and region to work together to solve problems. Download the 2018 Business Retention & Expansion Survey Executive Summary .